The brief was for a new house, to replace a decrepit bungalow, which would be a clean, bright, informal, uplifting family home, an exemplar of sustainability, and a sensitive addition to a Cotswold village all at the same time. Being right on the edge of an elevated village in the Cotswold Area of Outstanding Natural Beauty it was important the new building was comfortable in its context and did not proclaim itself in size, shape or material. 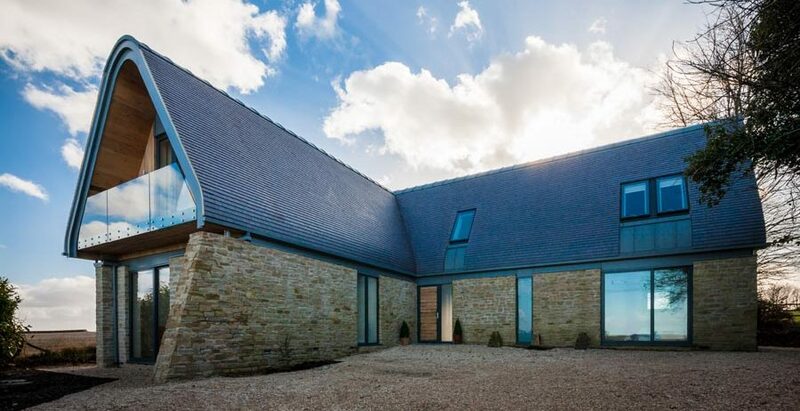 The scheme was sold to the planners based on the contextural qualities of the building materials and the typology of a barn-like aesthetic; a single storey of stonework with a steep-pitched roof atop. To contrast the crumbly contextural stone base Adrian James, the architects sought to make the roof a slick reinterpretation of a 'barn-roof'. Key to this was the selection of the roof tile to hold the composition together and smooth Staffordshire Blue Plain Tiles were selected due to their tone and sheen. The result is a house that is comfortably familiar from a distance but smooth and contemporary close up. The malleability of stone, plain tiles and zinc is exploited so together they spread up around and over the house in a single curved plane. Despite a tight budget, the building design and the finishes for this project were carefully controlled. Money was spent where necessary to create the standard of material, detail and finish necessary for both the interior and exterior aesthetic.